Protesters with the group Movement for Justice in El Barrio hold signs protesting the mayor’s plan to rezone East Harlem. The plan will allow new developments to begin construction in the neighborhood. Photo by Kristen Torres. 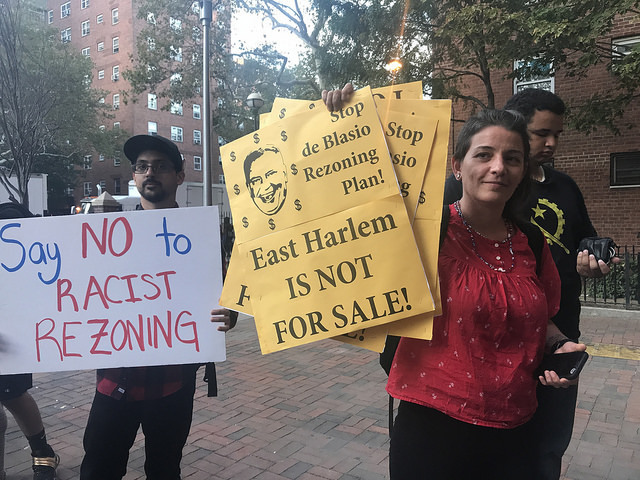 Protesters gathered outside an East Harlem town hall meeting last night to push back against Mayor Bill De Blasio’s plan to rezone some sections of the neighborhood. Salome Leon was one of the protesters. She’s part of a group called Movement for Justice in El Barrio, which aims to stop gentrification in the neighborhood. Leon said she’s lived in the area for the last 19 years. She raised her children just down the street from the Johnson Community Center, where the town hall meeting took place. The East New York Neighborhood Plan was announced by the mayor’s office in 2015, and is meant to create 1,500 new affordable housing units in the borough, according to De Blasio. Contrary to what Leon and her fellow protesters claim, De Blasio said the rezoning would actually help more people get out of shelters and into permanent housing. “When this is all over, we’ll have four thousand, five thousand people into new homes,” he said. 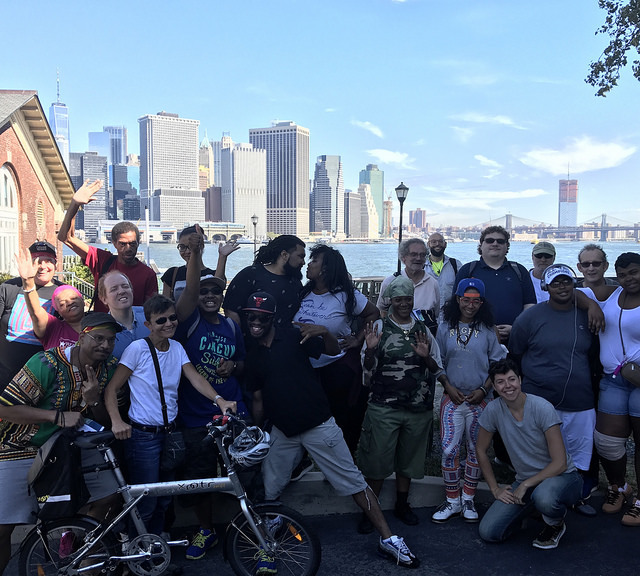 Last year, the city council passed the Mandatory Inclusionary Housing bill, which forces developers in certain areas to make at least 20 percent of a building’s units affordable housing units. 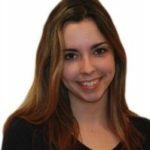 Ethel Velez is president of the New York City Housing Authority’s Manhattan North Council of Presidents. She pushed back against the mayor at the meeting, asking why so much money was going into building new affordable housing, while the existing units were falling into disrepair. Some residents also pushed De Blasio about his motives for the rezoning, claiming he was giving out development contracts to campaign contributors. 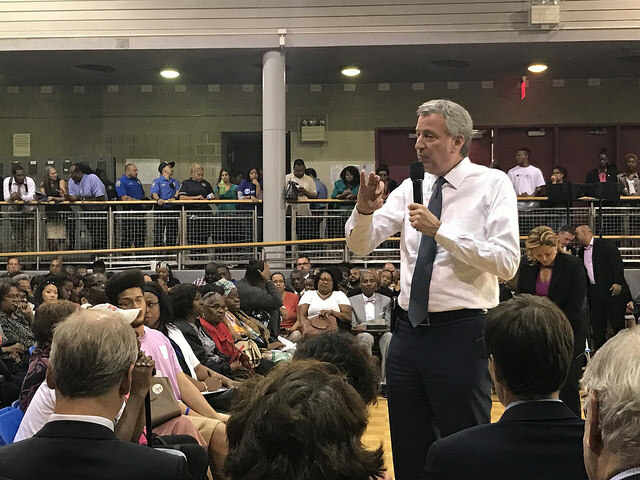 De Blasio also said current affordable housing buildings will never be switched over to private companies — a concern that many Harlem locals brought up over the course of the two hours. The rezoning plan says the city will rush the construction of 1,200 new public and private affordable housing units over the next two years in the neighborhood. It rezoned certain areas of East Harlem to allow construction of mixed use buildings, meaning developers can have storefronts on the ground level, and housing units on the upper floors.